Specializes in sports and adventure books for boys and young men. Picture books including the Bungalo Boys, Pokeweed Public School, Mooners, and New Reader series. Includes free activities and resources for teachers. Publishes storybooks, educational workbooks, coloring and activity books, novelty books, reference books, chapter books, and the Little Golden Books series. Free online childrens games and e-books. Publishers of graphic design books, architecture books, interior design books, fine art books, and craft books. Publisher of books that foster a feeling of connectedness between all human beings. Books downloadable in PDF format. International publisher of a wide variety of picture books. Includes professional reviews for many of the books. Creates hand bound books, restores rare books, makes wedding albums and baby books to specifications. Nonfiction, novels, picture books, and craft books. Publishes Franklin the Turtle series and books about Elliot Moose. Home to many of the classics of childrens literature. Includes the imprints Avon, Greenwillow Books, HarperFestival, HarperTrophy, HarperTempest, Joanna Cotler Books, and Laura Geringer Books. Site contains information about authors, contests, screen savers, activities, bookmarks, and computer wall paper. Canadian publisher of childrens books and young adult fiction. Specializes in picture books, novels, and French and Spanish language books. Publisher of short-run original books and book packaging services for authors. Titles include dulcimer building, childrens picture books, world war, and academic books. Inexpensive, nonfiction titles about a wide variety of topics including history, science, literature, women, music, and ships. Formats include coloring books, posters, CDs, and paper doll cut out books. Publishes high-quality, awarding-winning books for children including fiction, non-fiction, and picture books. Publishes high-quality, award-winning books for children including fiction, non-fiction and picture books. A New York based publisher dedicated to producing serious nonfiction by leading intellectuals, academics and journalists. Basic Books is a member of the Perseus Books Group. Publisher of motivational books, including books 'about admirable people and programs, and self-help books for people fifty and up'. Literature for pre-school aged children through young adult readers in all formats from board books to picture books to novels. Features beloved characters, series, and favorite authors and illustrators. australian made casual wear for boys and girls. provides swimsuit with floats for boys and girls. france. Independent publisher of childrens books, middle-grade chapter books, and young adult novels. Our mission is to create books that will entertain, enrich, and educate the minds of the young and the young at heart. Publish a small selection of books on 20th century warfare in the Aegean region. Books appear to be Greek text only, but well illustrated. Website text in Greek, Italian and English. Based in New York. Competition for girls and boys age 3 and up. Extensive list of books about design, materials science and manufacturing processes in the textile and nonwovens industries. From Powells Books. tel-aviv. boys clothing manufacturer, designing classic and tailored styles. baby layette items and name brand clothes for girls and boys. Professionelle Jingles fÃƒÆ’Ã‚Â¼r TV und Radio, nicht nur in ÃƒÆ’Ã¢â‚¬â€œsterreich. Publicity for many groups such as Beastie Boys, Radiohead, Foo Fighters, and Sonic Youth. If the business hours of Frost Hollow in may vary on holidays like Valentine’s Day, Washington’s Birthday, St. Patrick’s Day, Easter, Easter eve and Mother’s day. We display standard opening hours and price ranges in our profile site. We recommend to check out frosthollowpub.com for further information. 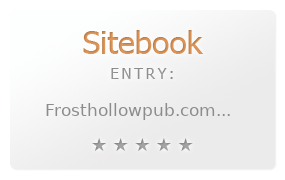 You can also search for Alternatives for frosthollowpub.com on our Review Site Sitebook.org All trademarks are the property of their respective owners. If we should delete this entry, please send us a short E-Mail.